Like a pony, this battery powered electric tugger has a lot of power in a small footprint. This tugger is suitable for all applications except the most heavy duty. The Tug Pony is a small but powerful machine that is able to move heavy loads. The standard machine is loaded with features such as an onboard battery charger! This machine can move up to 5000 lbs on 12” phenolic casters. 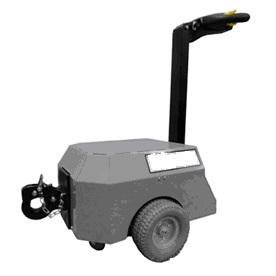 The Tug Pony battery powered mover is compact and easily controlled. The operator has variable speed control in both forward and reverse. 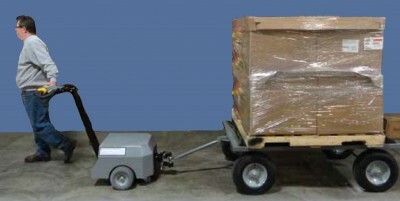 The operator can quickly and easily hitch and move a large load or cart. The Tug Pony tugger is equipped with all safety features such as an emergency stop, warning horn, and a holding brake. The automatic holding brake works on both flat and inclined floors. The onboard charger has an automatic shut-off. The machine is equipped with an automatic “sleep” mode to save power when not in use. The Tug Pony is ideal for institutional and industrial applications.